In Lausanne, Switzerland there are about 100 trolleybus for 52 km of network. There are 10 lines, 1 to 9 and 15. Interurban line 60 was trolleybus until 1998, I think it was one of the last interurban lines in Europe, with about a trolleybus each 40 to 60 minutes. The shortest is Shaffhausen, one line of about 8 km and 10 trolleybus: http://www.vbsh.ch/ . The city is quite small, wth 6 urban lines including the trolleybus. If you want to laugh a little... All the Neoplan duo-mode trolleybus of Lausanne are out of service since one month because two of them have completely burn. So, all of the FBW trolleybuses built in 1981-1984 and NAW trollebuses built in 1986-1990 are in service and a lot of diesel buses help them. Many vehicles were rented in other cities. What is fun is that 2 FBW from 1975, the same who are in Sibiu, came again in Lausanne for the drivers's formation. 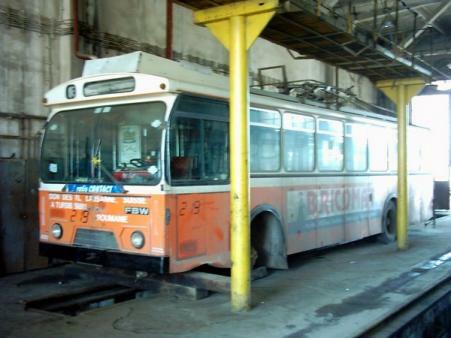 The trolleybuses FBW 91T (1975-1976) who came in Sibiu in December 2003 and April 2004 with the passenger trailer. The serie was in Lausanne 701-718 : 704, 705, 708, 710 and 714 came in Sibiu in December 2003, 712-718 came in April 2004. 701-703 and 709 were sold to another swiss public transport company, 706 and 707 were sold to TPG Geneva for the drivers's formation. These trolleybuses came again in Lausanne in May. 711 was kept as museum vehicle. Thanks, I love the FBW trolleybuses. And about FBW trolleybuses, do the ex-Zurich and ex-Lausanne articulated trolleybus 217 run ? Or is it completly out of service ? 217 waiting for good times. It isn't out of service but is out of some pieces. Yes, it's too bad that 217 not often runs. Last time I came in Sibiu it was out of service. 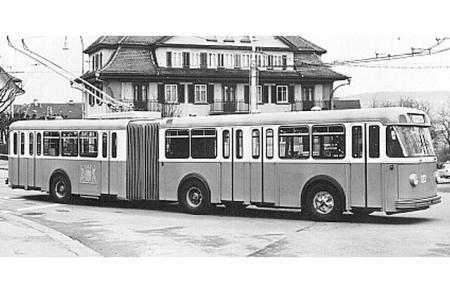 These trolleybuses were the first articulated trolleybuses in Switzerland, the first date of 1957, the last come in 1964 (33 vehicles total). Ok, thank you for infos. Another question. I know that Tursib has 2 FBW 91U diesel buses (Ex lausanne 401-412). 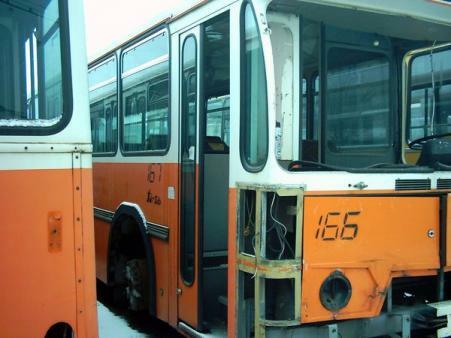 Last time I came in Sibiu, the 166 was in repair after an accident. Do it run again, or is it out of service ? The other FBW is for a long time out of service (#167, I believe). 167 is for scrap but 166 is still in service (see www.troleibuzesibiu.3x.ro). Dear FBW, the trolleybuses like 217 (ex-Zurich 803 -is correct?) are still in Valparaiso, CHILE? Tell us about. Do you have an personal web page with trolleybuses that run in Sibiu? 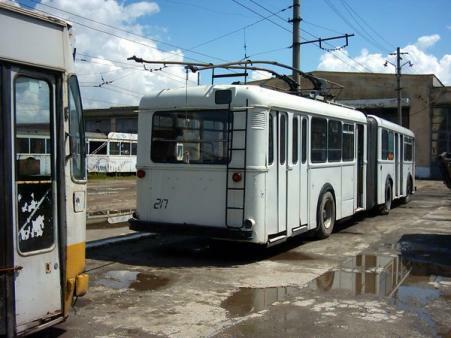 Trolleybus 217 has complex history. Built for Zurich in 1959-60, it was one of a big serie of articulated trolleybuses (101-133). 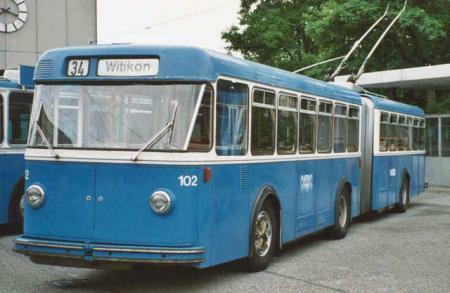 In 1989, Lausanne buys 3 of these trolleybus (#116, 122 and 123 in Zurich). In Lausanne they will be renumbered as 801-803. In 1990, 801-802 will be demolished, and 803, ex Zurich 122 came to Sibiu. Now it is #217 in Sibiu. # 105, 107, 109, 111, 129 and 132 were sold to Chile in 1991. To Santiago and Valparaiso. The trolleybus system of Santiago does not exist any more, so all ex Zurich trolleybuses are currently in Valparaiso and run. Oh, that's too bad. Is it any chance that 219 will be repaired ? Or is it too much broken ? 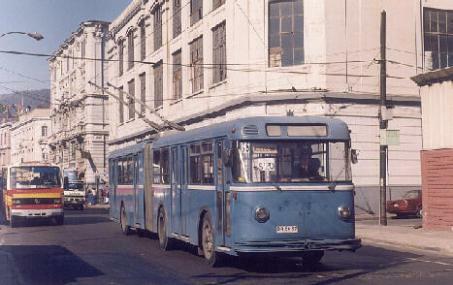 The last : trolleybus of the serie 101-133 ex Zurich, in Valparaiso Chile. He has still the original Zurich livery.